The one thing I felt "Straight Outta Compton" accomplished was in the effort it made to talk about the socio-cultural period framing hip hop. And I think it did a great job highlighting 2 things about the late 80' and 90's period. One was the impact drugs -particularly cocaine had on the Black urban core. Its use was rampant and there was a so-called war on drugs being waged on the Black community, by the state. These two factors along w/the drying of the possibility of finding work particularly in the manufacturing arena, are the foundation for today's school -prison pipeline reality. And while the film didn't speak directly about the impact these factors had on the Black community, it hinted that a lot of young Black people wound up raising themselves. This is a truly unfortunate factor, because it has generated both a distorted understanding about family and immature perceptions about resistance and change w/in this sector of the community. I thought the film did a great job in pointing out that during this period in which the attack on affirmative action was steam rolling over access to college, dealing drugs and or the production of music moved to the top of list for many working class Black youth as their way outta the hood. So while "Straight Outta Compton" didn't address the victimization of women that did- and does-take place, it did do a hella job pointing out that both the drug and music industries rest on a top down, male dominated and sexist, manipulative and paranoid life style that is capitalistic and for Black folks continues to prey upon the post traumatic slave disorder that shapes the consciousness of far too many African Americans 150 plus years after the ending of slavery. Good analysis by Steve Early. Typo, "Randi Weingarten herself makes $540,000 a year (as opposed to Buffy's mere $300,00)" Buffy received over $300,000., not what looks like $300.00. If it is not "to be business as usual" for the high leadership of AFL-CIO unions then they will need to move to the left and quit being sycophants to the Clintons who promise a better life for working people and then cut the benefits of the safety net in order to please "Big Business" and Wall Street. These labor leaders lead the way to two tier work forces, cuts in negotiated benefits, paltry wage increases for workers when corporate executives have moved their own wages into the clouds. Too many labor leaders have forgotten what their work is supposed to be: using the collective power of union organization to fight for a decent life for the working people of the USA, not the protection of the profits for corporate owners. As an anchor baby myself I know immigrants built this country. All my family worked, even those who in Europe would have been retired. Trump says illegal immigrants are drug dealers and criminals. If they were drug dealers they wouldn't be cleaning houses, mowing lawns and doing construction. They come to work, to be free and safe, to have a better life for themselves and their children. If they all left we would all be poorer. Re: The Greatest Threat to Europe is "Strategic Inhumanity"
This is worth reading. It is about the biggest lie of all, the lie that some human lives matter less than others. This lie has supported slavery, fascism, global capitalism....This lie has allowed a super-wealthy, powerful, tiny minority to stunt and destroy life for so many human beings. Let's pit American workers against Chinese workers so American capitalists can better compete in a trade war with Chinese communists. Obama's decision to green light Shell's Arctic drilling "makes his decision on Keystone XL even more critical," said Henn of 350.org. "We need to see evidence that the President understands that in order to prevent catastrophic climate change we need to keep oil in the ground." I don't get it he is capable of good why does he do this? We can never forget. Racism still plagues our society. Please read article above about Nurses' Union Election. See the struggles people make just to be in a Union. Also, see how two nurses were fired and one suspended for supporting to have a Union. Law firms are consulted to keep Unions out. Wake up non-members, Wake up!!!!! Wouldn't the Alien and Sedition Acts of 1798 be the first Red Scare -- passed by Federalists petrified by the French Revolution? The missing element in this debate about yes/no on decriminalization and associated acts is the observation that these issues can come up only in a world in which women's survival and economic choices are severely restricted. And our contribution to the solution lies in becoming advocates for expansion and protection of women's survival options. Any other choice leaves women hostages to the choices and power of others, specifically the men (and women) who run and patronize the trade in -- well, it's the buying and selling of each women's power of choice. Amnesty's involvement recalls a little event that I witnessed at a regional conference of Amnesty forty years ago: Attendees were about to have our first meal at the conference. We were told that each table should have a representative come to the food distribution window and get one large bowl of each course's food and return to their table. We were further advised that if we saw more than one bowl of the same item on our table that meant that another table was without that course. I thought that was emblematic of the issue of the human right to survival (the most basic right without which no others count). More than enough of the means of life for one group might equal less than enough for another, and any attempt to preserve rather than correct that situation was sure to lead to all other violations of rights. And here, in this women's freedom issue as in so many others, that holds true. I did not read more than the first few sentences of this article, because it was so packed with pejorative terms. Amnesty International is not a bunch of apologists for prostitution, and their views deserve to be taken seriously, even if one does not agree with them. Janice Raymond does not take AI seriously, so I have no use for what she says. An additional way to promote understanding of climate change would be to give people clear examples of ways to mitigate climate change and how that would affect would affect individuals -- essentially a cost-benefit rubric. How do the authors of this piece account for the historic increase in the numbers of obese people, here and abroad? This article is repulsive to the many people who can't stand dogs and think that they're dumb beasts without any charm. 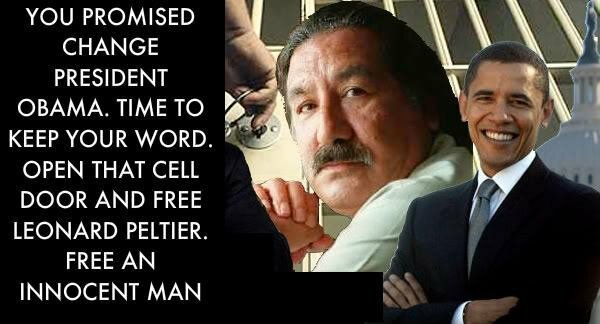 To honor Leonard Peltier's 71st birthday. Although not a new film, Warrior covers the story of Leonard Peltier, an innocent man locked away for life in the U.S. prison system. Leonard is a Native American political prisoner, convicted of a crime that he did not commit during a bloody shootout on the Pine Ridge Reservation in 1975. Around the world his trial and conviction have been denounced as a sham. Please join us and sign a birthday card to Leonard and a letter to President Obama asking that he grant executive clemency to Leonard. Nearest subway is the F train Second Ave. stop -- not far is the #6 train stop at Bleecker and Houston. Help AUD honor founder Herman Benson's 100th birthday. Join us for the preview of a short film about Benson's work and the history of AUD, as well as speakers involved in the labor movement. Afterwards, we will have a celebratory dinner and reception where you can catch up with old friends and meet the people who are the future of union democracy. Sponsor, Patron, Benefactor, and Clarion tickets all come with ads in our program book! Once you have purchased your ticket, AUD will contact you regarding your ad. If you are unable to come or choose to purchase a ticket that does not come with an ad in the program book, you can still purchase ad space! Just go to our website and scroll to the bottom of the page to download the form.